I was interviewed recently for the series #WritersTalkPolitics for the Indian cultural forum. Go here to view the interview. World Literature Today has published my observations on what it meant for me to invent a Tamil world in English in my most recent novel Ghost in the Tamarind. Language, politics, translation–the essay touches on these and other challenges. “Writing beyond English” started as a presentation at this year’s AWP, so a shout-out to my most exemplary co-panelits Nandi Odhiambo, Stephanie Han, Samrat Upadhyay, and Peter Kimani. Go here to see what I wrote for Literary Hub about the topic. Obviously I was constrained by space specifications and also by my own limitations of language and experience. What would you add? Or subtract? How might you modify? Journalist Gauri Lankesh has been shot dead in India. The simple fact of the matter is that no democracy thrives by stamping out speech that challenges power. I am not a free speech fundamentalist (I leave it to right-wing ideologues in America to self-servingly use a narrow and formalistic understanding of free-speech rights in order to advance their agenda). At the same time, I certainly value free speech–not only as a writer and teacher, but as a citizen of the world. What is routinely under threat these days is not only the word but imagination and alternative understandings of traditions, including Hindu traditions. I guess, in today’s world, it’s never too early or too late to register your opinion regarding the murder of writers. However, Fandry (2013, in Marathi, dir. by Nagraj Manjule) and Masaan (2016, in Hindi, dir. by Neeraj Ghaywan) are two films currently available on Netflix (at least, in the US) that I usually mention without hesitation in response to such queries. Both films are of course subtitled (they are also available unsubtitled on YouTube). I share the criticisms of subtitling that many film studies scholars as well as cinephiles make. Nevertheless, Fandry and Masaan are worth watching. I recommend Fandry and Masaan not only for the ease with which they can be accessed on Netflix but because of the quality of their filmic storytelling, the sensitivity as well as boldness of their treatment of caste, and their ability to tell stories that let in viewers from across India and across the world without pandering to them. This last feature of the films—a broad appeal that is combined with a strong sense of location—is not easy to achieve. The films manage this balance I think by placing at their core narratives that have a certain universality to them. Fandry’s core narrative is about a boy (Jabya) at the cusp of adulthood who chafes against his “low” (caste-defined) station in life. The film is in a sense a coming-of-age narrative, though it is open to question whether at the end of the film Jabya has been given the space to mature in any positive sense. Jabya goes through various experiences in the film. He is attracted to a “high-caste” girl and repeatedly quarrels with his father. With a friend, he fruitlessly pursues a fabled black sparrow. This pursuit becomes a metaphor for his life. Fandry is set in a small village in Western India, and this setting allows the social relationships that hold Jabya in their grip to be portrayed with a clarity that would have been more difficult if the film had been set, say, in a city. Masaan is less easy to summarize. It has more characters—and more fully developed characters—than Fandry. Like Fandry it focuses attention on young people just beginning to make their way in a world constrained by caste—though the four characters I have in mind here are young adults rather than teenagers like Jabya. Masaan’s approach to issues of caste is more layered and complex or, alternatively, more baggy. I suspect there are many aspects of the film that will remain opaque to uninformed viewers. Nevertheless, the core narrative of the film manages a rare psychological complexity about questions of caste without becoming inaccessible. Both Fandry (Nagraj Manjule’s similarly themed 2016 film Sairat is also available on Netflix) and Masaan bring out the horrors of caste (or the varna-jati complex) with some subtlety and a considerable sense of outrage. In other ways, they are quite different. Fandry is darkly comic in parts though its overall anger is unmistakable. In contrast, Masaan is suffused by an atmosphere of tragedy and despair. The films are not an ethnographic introduction to caste—for a basic overview the uninitiated viewer will have to go elsewhere—but together they do capture effectively even for viewers who have not studied caste or grown up with its reality in their lives the moral and emotional quandaries at the heart of the varna-jati complex. Can there be such a thing as postcolonial philology? I am prompted to pose this question by the impending workshop on Caste and Life Narratives at the University of Hawai`i at Mānoa. The workshop is related to a forthcoming special issue of Biography edited by Charu Gupta of Delhi University and me (side bar: much gratitude to the journal for responding enthusiastically to our proposal). The workshop, which will be held next week, has me thinking of the subterranean travels of caste into the English language. Given the centuries-long British colonial presence in India, and the even longer presence there of English, it is hardly surprising that words of Indian origin have found their way into the language. Interesting in this context are the translations the words have undergone—especially those words that remain marked in unacknowledged ways by the social history of India, including the history of caste (or, to use the term I prefer, of the varna-jati complex). I believe a postcolonial philology can provide novel insights into this social history. Native speakers of English know they don’t want to be pariahs, but how many of them are aware that the word has its origins as an appellation for a group of people who suffered horrific shunning within a highly structured social system with a deep history? Considering it inescapably tainted by the whiff of degradation, many intellectuals and leaders of this social group have long since discarded the use of the word Paraiyar in referring to themselves. Meanwhile, native speakers of English continue to be blithely unaware of the anglicized version pariah’s association with the terrible history of an actual community of people. Another English word that a postcolonial philology might explore from a “caste” perspective is pundit. The word, meaning a learned or wise person (though now, increasingly, used sarcastically), comes from the opposite end of the varna-jati spectrum from pariah. Pundit is borrowed from Sanskrit, probably via Hindi. It is not at first view a jati name—it does not refer to or name a particular jati community in the way in which Paraiyar does. Pundit is simply a title and as such can be donned by anyone (indeed the Adi Dravidar, or so-called “untouchable,” Tamil scholar and activist Iyothee Thass is often honorifically identified with the title Pundit). Nevertheless, the word has a definite patrician, even Brahminical, air about it since it is most commonly used to refer to Brahmin priests. How many native speakers of English in other parts of the world, or for that matter in India, reflect on the possibility that they are reinforcing casteist ideas of knowledge and wisdom—ideas of the innate wisdom of certain groups of people—by using the word pundit? Obviously, by posing these questions I don’t intend to suggest that native speakers who are unaware of the etymology of words such as pariah or pundit become casteist simply by using them. At the same time, as philology teaches us, languages and language use are consequential. Languages commit us to certain perspectives on the world, though not in a deterministic way—I am enough of a writer to believe in the possibilities of imaginative transcendence inherent in all languages, in language as such. The point of a postcolonial philology would be to explore languages as repositories of the social history of colonial encounters and of postcolonial societies—and then after exploring, where necessary, adjust language use. It is in this context a postcolonial philology can be useful in providing us with a method to trace and assess the transmission of ideas and values across cultural and linguistic divides. Once again California public school textbooks are at the center of furious public debate. Groups that have declared themselves guardians of Hinduism are engaged in a campaign to rid California textbooks of what they consider grave, even discriminatory, errors. Some of the controversy has concerned the use of the term South Asia instead of India—the aforementioned guardians of Hinduism abhor the use of South Asia to refer to what they regard as the historic area of India as a whole (that is India before partition in 1947). As a co-founder of SAMAR (South Asian Magazine for Action and Reflection), I am familiar with this terminological debate. When we dreamed up SAMAR in 1992 in Austin, Texas, we deliberately chose the term South Asia to signal an inclusive and anti-nationalist perspective—we wanted to address not just Indians but also people who traced their origins to other parts of South Asia like Pakistan and Bangladesh. In a small way, SAMAR contributed to the spread of South Asia as a widely employed term in the US. It was clear to me then that South Asia and India had different and differently valid uses based on what one was trying to say. Nothing has happened to change my opinion. The use of the term India by Hindu nationalist groups to refer to a geographical area that today includes several countries other than India is patently absurd. What might be less clear to those not steeped in these recondite debates is that this is also an attempt to advance a militantly expansionist idea of India. Hindu nationalists dream of an Akhand Bharat or Unified India—an India unified that is under Hindu ideals—and to substitute India for South Asia wherever possible represents their desire to smuggle in this idea of Akhand Bharat through a series of displacements that it would take me too long to explain here. Another part of the California textbook controversy concerns caste or rather, to use the term I usually prefer, the varna-jati complex. The same Hindu nationalists launching covert campaigns for Akhand Bharat work ceaselessly to minimize the role of caste discrimination in India. Caste is not just Hindu, they say; caste is not the rigid system that Orientalists make it out to be, they declare; caste is not the sole reality of India, they argue—all of which is true, as I have noted in my own writings on this subject, especially in my book Flesh and Fish Blood. What the Hindu nationalists fail to add is that caste is nevertheless more Hindu than not, that caste and the discriminations associated with it have proven stubbornly resistant to eradication, and that caste is certainly one of the most significant aspects of the reality of India. Hidden in the California controversy lie other important questions: Who speaks for Hindus in America today? Who should speak for them? Are practicing Hindus alone permitted to weigh in on questions regarding Hinduism? What about an atheist like me, who was raised in Hindu traditions? And what about someone who is neither a practicing Hindu nor was raised in a Hindu family but who has studied Hinduism deeply in a scholarly way? I have an anti-identitarian perspective on these questions—which is to say, I believe anyone can speak on these matters but no one, Hindu or non-Hindu, can be exempted from being knowledgeable and balanced. I am an atheist from a reasonably devout Hindu family who has raised an Indian American son in the US. I know from personal experience and from the experience of my son that there is much ignorant stereotyping of India and Hinduism in the US. Putting my atheism aside for a moment, I think it is worth insisting that textbooks appraise Hinduism with the same evenhandedness that they might other religions (for example, by noting that Hinduism is not devoid of democratic impulses), and that they be aware of the ways in which misconceptions about Hinduism might be used to bully Indian American children from Hindu families. On the other hand, Hinduism has certainly been the basis for the abjection and rank oppression of large groups of people including Dalits—which is one of the reasons I am an atheist. Surely Dalit American children in California deserve the same right to a truthful assessment of their historical reality that Hindu American students do? Given the enormity of historical crimes done to Dalits and others regarded as “low caste” there can be no compromise here, no sentimentalism about tradition. In the final analysis, Hinduism is as much a social phenomenon and cultural tradition as it is a religion; and in this context I have as much right to speak of it—as well as, if necessary, against it—as a devout Hindu. It would be easy to get sentimental about my mother’s ancestral village, especially for someone like me, who has never lived there but has been raised to think of it as “home.” The seductions of roots are more real than one imagines; at the same time, as an incident during my research trip conveyed to me unmistakably, when it comes to history there is nothing more dangerous than sentimentality. The incident occurred on the second day of my visit, as I wandered my way through the village to the sandy bend of the river that flows past. Arriving at the bend, I encountered the village’s washerman—a small lean man who with his wife was laundering clothes in the flowing river. Drying garments were spread out on the sand. A little distance away his donkey—the beast of burden on which he carried clothes back and forth—was tethered to a bush. I stopped to talk to this man, and soon learned that he had inherited his job from his father, and that it was becoming less and less feasible for him to continue in his trade. My sons, he said, no longer do what I do. They have moved away from here, this village. I will be the last man to serve as washerman in this village. I nodded, thinking to myself, yes, a modernizing society shatters traditional caste roles. I asked, wondering about his sons, What do they do? And then he said the thing that to me encapsulates beautifully—horrifically—the conundrums of caste. The answer was startling, though perhaps I shouldn’t have been startled. One of the sons, it turned out, worked in the laundry room of a naval base in Kerala; and the other in a similar facility in a hospital in Chennai! They worked, my friend the washerman told me with pride, in a modern workplace with washing machines and driers. You can leave your caste profession, I observed to myself, amending my previous thought. But your caste profession it seems won’t leave you. Rohith Vemula’s suicide note is enough to break your heart. I am tempted to say that in it, just as in the story of the washerman and his sons, we see the unstoppable force of a modernizing society encountering the immovable rock of caste—but of course that is only a smart sounding half-truth. There are no unstoppable forces or immovable rocks in history. India may have its deeply rooted structures, but it cannot be reduced to the timeless fantasy of Orientalism. When it comes to caste, there are only heartbreakingly difficult realities; and the unavoidable, unsentimental truth that India’s future depends on a sincere, democratic, inclusive—indeed, revolutionary—solution to the conundrum of caste. That solution is possible but it will be hard fought. No, that won’t do. It won’t do to blithely write couples; as far as the world knew, heterosexual couples promenaded, sometimes with their families. If there were people on the beach who were not heterosexual (and surely there were), they were not visible. That was the beach. 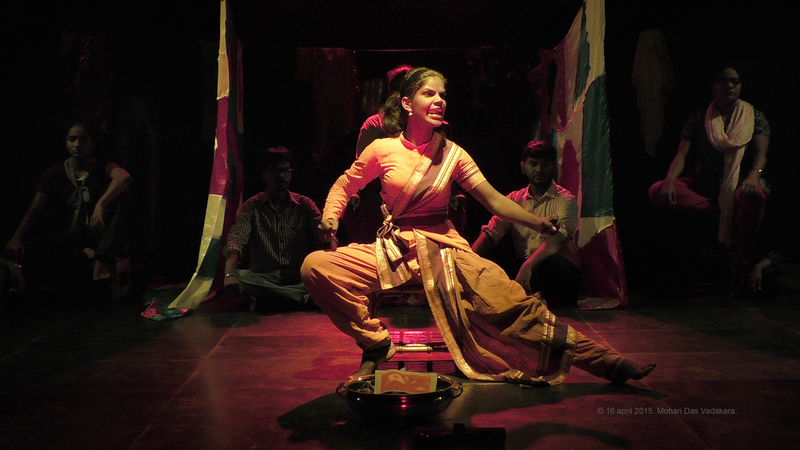 Inside the auditorium, things were different, for Naanga Ready tries to make visible that which society renders invisible. In a series of vignettes loosely held together by the characters, the play explores the impossible gender choices that society forces upon us. 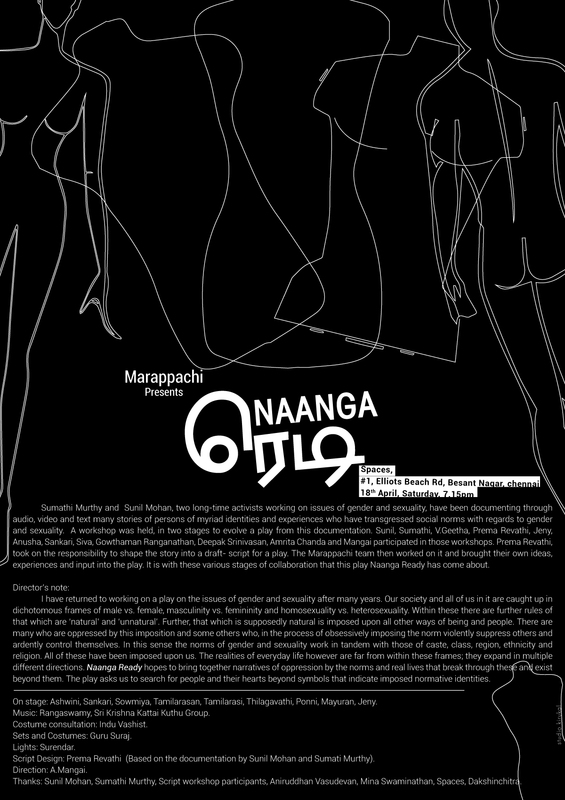 Mangai is the director and presiding impresario of the play, which was written by Prema Revathi based on interviews conducted by Sumathi Murthy and Sunil Mohan. 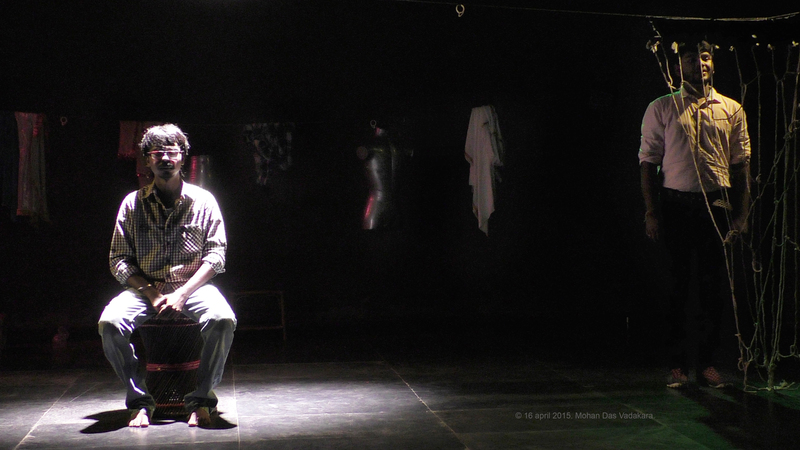 Mangai is a veteran of alternative Tamil theatre in Chennai. Her roots are in equal measure in indigenous performance traditions like koothu and political theater from around the world (she is, I know, a keen reader of Kenyan playwright Ngugi wa Thiong’o). Both influences were apparent in Naanga Ready. The set design—a clothesline from which clothes and body dummies hung, a net from behind which a gay character spoke of his tortured relationship to his mother—was abstract and suggestive; and the impressive concluding sequences of the play featured folk traditions, including the performance of divine possession, prominently. Shakespeare was wrong. All the world’s not a stage. Sometimes, thankfully, the stage is a welcome refuge from the unrelenting cruelties of the world. It is a bounded space of exploration in which to articulate ideas and desires ruled out of bounds in the world. Not all boundaries are bad. Theater has a long and distinguished tradition of calling intolerance to account from within its bounded space. Naanga Ready belongs proudly to this history. It calls to strict account the prejudices of the world at large, so blissfully taking the air on the beach nearby. GHOST IN THE TAMARIND is now AVAILABLE for purchase! Read the Hindu review here! As a scholar-novelist, I write fiction that is deeply researched, while my scholarship is driven by my practice as a novelist. I teach at the University of Hawai’i at Mānoa in the English Department. Here you will find links to books and articles, PDFs of select scholarly essays, videos of presentations, and other relevant materials. Click on the Follow button below if you would like to receive notifications of new posts to my blog. “The Languages of Love: An Essay on Translation and Affect” in Comparative Literature 69.1, 2017. “Literatures of the World: An Inquiry” in PMLA 131.5, 2016. Critique of World Literature idea.